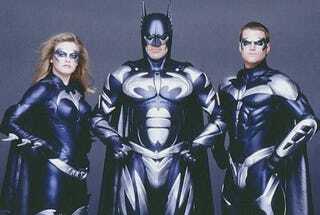 Akiva Goldsman finally admitted it: Batman And Robin was not his finest hour. But superhero buffs it was the most important movie in superhero history, and Goldsman is planning a slew of new movies about DC's heroes. "What got lost in 'Batman & Robin' is the emotions aren't real," Goldsman said, picking his words carefully. "The worst thing to do with a serious comic book is to make it a cartoon. I'm still answering for that movie with some people." But perhaps Kevin Feige, the president of production at Marvel Studios, explained B&R's significance better, "That may be the most important comic-book movie ever made...It was so bad that it demanded a new way of doing things. It created the opportunity to do 'X-Men' and 'Spider-Man,' adaptations that respected the source material and adaptations that were not campy." And he's got a point: it did teach us all that there is a wrong way and a right way to make campy comic book movies. And if it made future comic book screenplay adapters more careful with how they portray this world, then that's one thing it has going for it as well. Interestingly the horrible failure of a film didn't stop Goldsman from moving forward with his career and putting out the very successful A Beautiful Mind adaptation. And now that he's established his bona fides as a more serious writer, moving on to I Am Legend and writing/directing for Fringe, he's coming back to DC Comics, working on a number of upcoming projects. Goldsman said will be closer in tone to the character as presented in Alan Moore's eerie, metaphysical horror comics than the rubber-suit bog creature from the 1982 Wes Craven B-movie. "We want a film with real Southern, dark horror overtones, a little bit like a classic Universal horror film," Goldsman said, knowing full well that his presence on the project will stir controversy — it's a character that filmmaker Guillermo del Toro has called one of the "few remaining Holy Grails" in comics. But it's not just DC heroes in Goldsman's future — his big-screen directorial debut may be a version of A Winter's Tale, Mark Helprin's fantasy novel set in an alternate New York, with a thief and a flying horse.